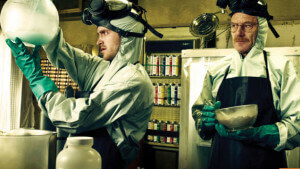 Here’s a Breaking Bad question for you: If Walt lets Jesse cook a batch of Meth and Jesse screws it up, such that it is unsellable, can they be punished for the amount of bad methamphetamine that they cooked in addition to the amount of good methamphetamine (if there were such a thing)? This 5th Circuit tells us in United States v. Ramirez-Olvera. Antonio Ramirez-Olvera was convicted of possessing methamphetamine (meth) with the intent to distribute, violating 21 U.S.C. § 841(a)(1) and (b)(1)(B); he received a sentence of 240 months imprisonment, which is ten years below the bottom of the federal sentencing guidelines range for this offense. Arguing that the district court excessively punished him, as the court did not distinguish between d-methamphetamine (“d-meth”) and l-methamphetamine (“l-meth”) for the sentencing guidelines’ equivalency table, Ramirez-Olvera appealed to the United States Court of Appeals for the Fifth District. How Should the Court Determine the Weight of Meth in a Possession Case? The issue before the Court is whether federal courts must distinguish between the types of meth when deciding punishment, or, whether courts can punish based on a “lump sum” of the meth. As you can imagine, higher amounts generally mean a longer prison sentence. Had the district court used only the d-meth in its calculations, Ramirez-Olvera’s prison sentence might have, in theory, been shorter. Relying on DEA lab reports,Ramirez-Olvera’s probation officer generated a presentence report that recommended, he “should be held responsible for 7.7 [total] grams,” combining both the l-meth and d-meth seized fromRamirez-Olvera’s home and car. The Court discusses types of methamphetamine, highlighting the differences scientifically and practically. “D-meth and l-meth are stereoisomers of meth…consist[ing] of identical molecules [that are] differently arranged.” United States v. Acklen, 47 F.3d 739, 742 (5th Cir. 1995). D-meth causes psychological and physical changes in humans. L-meth, on the other hand, “produces little or no physiological effect when ingested.” Id. Further, L-meth is a “weak form of [meth], is rarely seen and is not made intentionally, but rather results from a botched attempt to produce d-meth.” U.S. Sentencing Guidelines Manual § 2D1.1(c)(1)(2014). In other words, l-meth is an accidental byproduct when creating d-meth goes awry; L-meth has little to no cash value. The Court reviews this case anew, focusing on the plain meaning of the Federal Sentencing Guidelines for drug crimes; the Guidelines are the authoritative, controlling source of law. United States v. Moore, 733 F.3d 161-63 (5th Cir. 2013). Amendment 518, “a 1995 amendment to § 2D1.1, indicates that courts need not distinguish between d-meth and l-meth when determining the quantity of…meth attributable to a defendant.” U.S. Sentencing Guidelines, [Sentencing Commission Dicta], §2D1.1(c)(1)(2004). Under this amendment, “l-meth [is to] be treated the same as d-meth…thereby simplifying guideline application [from this point forward].” Id. Further, the Court “ha[s] relied on Amendment 518 to hold [in an unpublished case] that any distinction between d-meth and l-meth is now immaterial when calculating drug quantity under the guidelines. United States v. Beltran, 91 F. App’x 349 (5th Cir. 2004). The Court affirms the district court’s opinion, holding that under Amendment 518 to the sentencing guidelines, meth no longer is to be categorized for sentencing purposes; l-meth and d-meth are to be added together to render the quantity courts will use in assessing punishment. All meth created, pure and botched, will be added together to determine a defendant’s prison sentence.